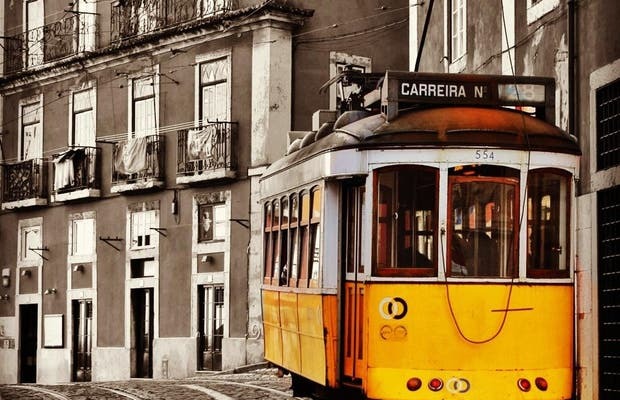 Line 28 of Lisbon´s tram system is, perhaps, if not for sure, the most charming of the city. Walking the steep streets of the capital is an ideal route for tourists because apart from passing many monuments (Castelo San Jorge, B º Alfama, Sé, Mirador de St. Lucía ...), it is very cheap (only 1, € 40) compared to tourist trams that were primarily developed for the same trip (it sells for around 12 to 13 € / day). The tram stops are endless, often stopping to spend every 15-20 minutes as traffic jams in this are frequent due to its narrow lanes (it seems impossible for two trams to cross each other) and truly chaotic traffic ( more so than Madrid ...). Lisbon is a unique city, it's as if time stopped in the nineteenth century - its cobbled streets, houses with chipped facades, trams, trains, everything evokes centuries of glory. It's decadent but grabs you from the first step on. The views, from the upper quarter and from the castle of St. George, are genuine postcards full of life, color and magic - ideal for a weekend. One of Lisbon's tourist attractions - the legendary tram nº 28 has been in operation since 1914. It travels about 10 km, takes just over an hour and connects with many of the city's major attractions. Traveling by tram is quite an experience as there are times when the streets are so narrow that you can touch the walls. A great way to see the city and integrate into the streets in a fun and inexpensive way.